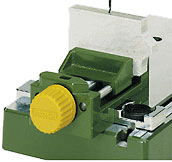 Small and beautiful - the accurate mill for lab, optician, jewelry, electronic and model building projects. Hand wheels with zero adjustable scales: 1 revolution = 3/64" (1.0mm), 1 division = .002" (0.05mm). 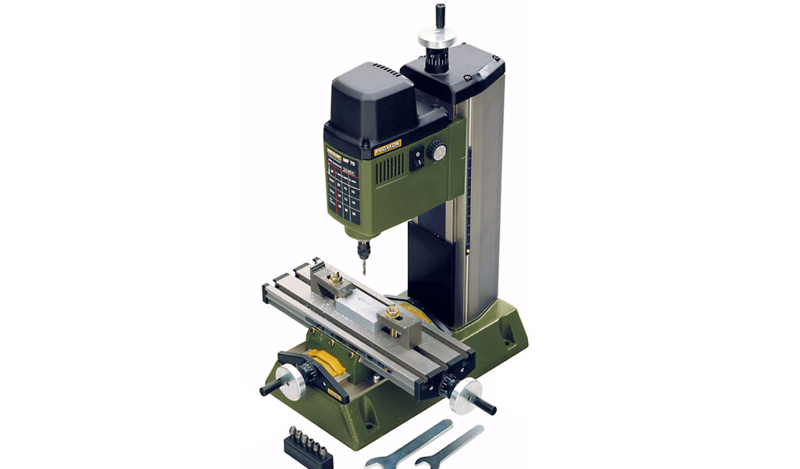 Continuously variable speeds from 5,000 - 20,000rpm, perfect for even the smallest milling cutter. MICRO Compound Table KT 70 of stable aluminum. Both axes are fitted with adjustable dovetail slides. 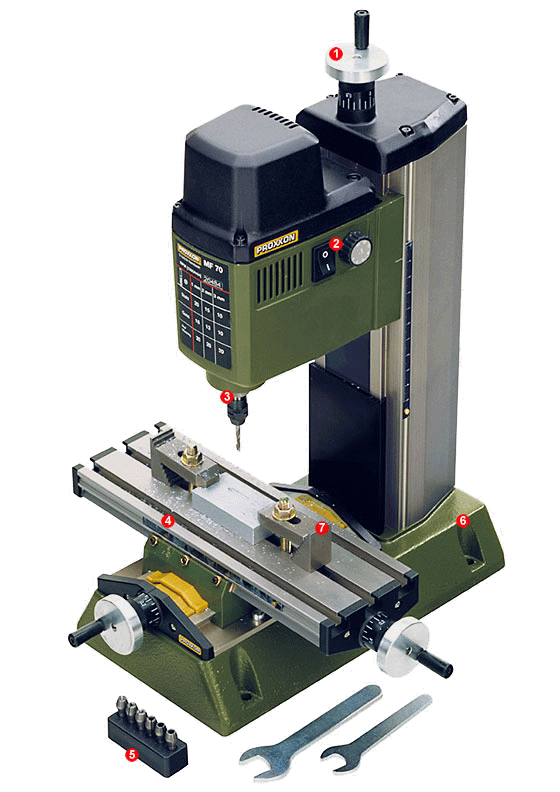 Optionally this machine may also be used with our three-jaw steel drill chuck. The unit is supplied with a stable base of cast iron. Both vertical column and compound table are of treated, high quality aluminum. All axes are play-free and have adjustable slides. The headstock, made of die-cast aluminum, houses the 24 pole balanced special motor and provides stability even at high operating speeds. 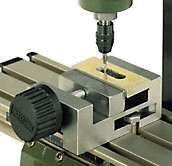 This stability facilitates the use of the finest cutters. Six triple slit, hardened MICROMOT steel collets come with the machine and cover shank sizes of 1/32", 1/16", 5/64", 3/32", 7/64" and 1/8" (1.0, 1.5, 2.0, 2.35, 3.0, 3.2mm). The table is fitted with three T-slots of the 15/32" x 15/64" x 13/64" (12 x 6 x 5mm) MICROMOT-norm. An adjustable ruler scale eases the positioning of the work piece. All hand wheels are zero adjustable with 1 revolution = 1/32" (1.0mm), 1 division = .002" (0.05mm). These double flute cutters are made from solid tungsten and are to be used for clockwise cutting. The fishtail profile ensures cutting to the center, allowing boring. Usable on cast iron, hardened cast iron, steel, cast steel, brass, aluminum, and even glass, plastics and carbon fiber. 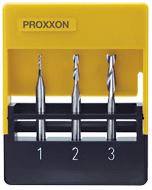 The set includes one each of 1/32", 5/64" and 7/64" (1.0, 2.0 and 3.0mm) shank diameter: 7/64" (3.0mm).